Campers can sleep well clear of the ground on the single, double and King Flock Excellent airbeds which not only oﬀer sleep comfort but also make getting in and out much easier. Raised all-round edging oﬀers ﬁrmness for extra stability along the sides, avoiding rolling oﬀ in the night. Tough PVC material shrugs oﬀ the spills and snags of camping life with a velour top for a soft, warm feel. Practical details include a double-seal inﬂation valve and handy carrybag. Incredible shipping speed, four days delivered to my door in NZ !!! WOW. and the beds are really good too. 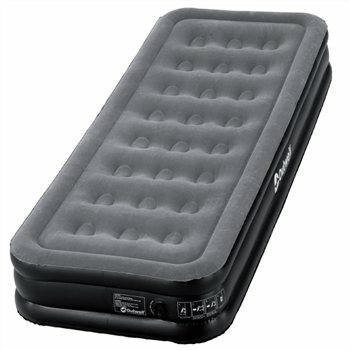 Very good air airbed, have used it for three weeks and slept well every night. Important to have an electric pump to blow up madrassem with. Flock wit Great comfort, used them since 2008, needed a new one,and the choice was easy. like the generous with and length..